Iranian Moderates Make Big Gains In Parliamentary Elections : The Two-Way Final results are trickling in from elections — the first since last year's nuclear deal — that began last week. So far, they're a stunning blow to Iran's hardliners. 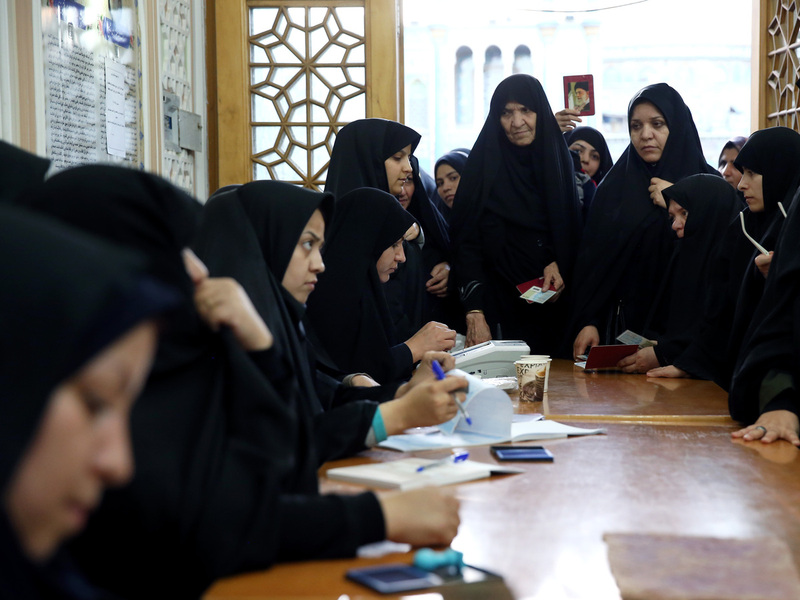 Iranian women vote in the parliamentary and Experts Assembly elections at a polling station in Qom, 78 miles south of the capital, Tehran, on Friday. As Camila Domonoske has noted for The Two Way, "Tehran's delegation is only a fraction of Iran's 290-seat parliament," and conservatives are poised to win seats in other parts of the country. Moderates also made gains in the powerful 88-member assembly charged with choosing Iran's supreme leader, Peter says. He adds: "Allies of President [Hassan] Rouhani took 15 of the 16 seats from Tehran, according to the state news agency IRNA." By comparison, "moderates previously held around 20 seats in the assembly," The Associated Press reported. The same is true for the parliament, AP says. "Reformists currently hold fewer than 20 seats and have been virtually shut out of politics since losing their parliamentary majority in the 2004 elections," the news service writes. "Even before official results are announced, Rouhani praised the vote as a move to strengthen the country. Rouhani needs a parliament he can work with to deliver on his campaign promise of reviving Iran's economy." Many reformist candidates who wanted to run were not allowed to do so — only 200 reformists who applied were approved to run by Iran's "unelected, constitutional watchdog," according to the AP. "There are people who are hard-liners on certain issues but for instance would be open to economic reforms. Does that make them a moderate? At the same time they might be saying the hijab — the Islamic headscarf — is obligatory and they might propose police controls to check women to do that. So these labels are very, very complicated." Election turnout was 50 percent in the capital and 62 percent in other provinces, Minister of Interior Abolreza Rahmani Fazli told reporters. "This election can be a turning point in the history of the Islamic Republic."